We've suggested some day trips that can be made, based out of Cooktown, that will give you a good selection of the diverse birds that the Cooktown district has to offer. 1. Wet Tropics rainforest south of Cooktown – A well kept secret, but the area just south of Cooktown boasts all the same Wet Tropics endemic species that you are likely to see near Cairns and the Atherton Tablelands. So if you want some real discovery birding – leave the those places behind, and head up north. These rainforests are home to such species as Macleay's Honeyeater, Bridled Honeyeater, Pied Monarch, Victoria's Riflebird, Chestnut-breasted Cuckoo, Yellow-breasted Boatbill and during the summer wet season – Pied Imperial Pigeons, Buff-breasted Paradise Kingfisher. Side excursions can be made just south of Helenvale, into the Shipton's Flat area and on up into the highlands of Mount Misery and Mount Poverty. Alternatively, a walking track leads from behind Mungumby Lodge to Hidden Falls and another up to the Big Tablelands. At these higher altitudes are found Tooth-billed Bowerbird, Fernwren, Mountain Thornbill, Chowchilla, Bower's Shrike-Thrush, Grey-headed Robin, and Blue-faced Parrot-finch. There are even locations for Golden Bowerbird and Atherton Scrubwren, but you will have to climb up Mount Finnegan to find these two high-altitude specialists. Good places to base yourself for this area are Lion's Den Hotel or Mungumby Lodge, both of which cater well for bird watchers. 2. Cooktown walking tracks – This is the day to leave your car parked up and head off to discover Cooktown's birding spots on foot. Cooktown has a great set of walking tracks that go along the Endeavour River estuary, mangroves and saltpans, continuing through the dominant melaleuca forest of the residential areas, the Botanic Gardens and beaches at Finch's Bay and Cherry Tree Bay. There is even rainforest on Mt Cook National Park. There is a great mix of bird species amongst these habitats with about 150 species recorded. Some of the notable ones include the Cape York speciality Tropical Scrubwren. 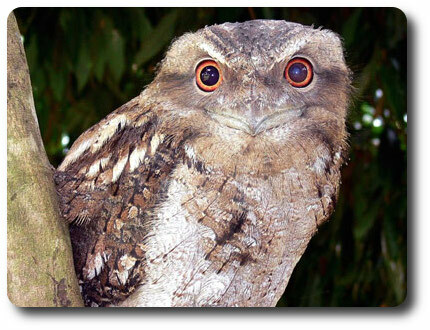 A sojourn here at night will often turn up Papuan Frogmouth and Large-tailed Nightjar. 3. Beaches and wetlands – A short drive out of town brings you to Keating's Lagoon. This lagoon has a bird hide, where you can see numerous ducks, pygmy-geese, jacanas and magpie geese. Another good coastal area is just a bit further south, at Archer Point. Again, a favourite spot for Eastern Reef Egrets, several species of terns and waders, plus Beach Stone-curlews and the vocal Varied Honeyeater. Great Barrier Reef islands such as Lizard and Hope Islands are also on our door step. Boat charters to these islands can be organised, as well as to the reefs (see section on boat charters below). Likely species include Crested and Lesser Crested, Roseate, Bridled, Sooty, Common, Little Terns, Common Noddy, as well as Brown Booby, Masked Booby, and Lesser and Greater Frigatebirds. 4. Another option is to take a boat trip up the Endeavour River and mangroves. There are numerous waders and terns at low tide on the sandbanks in the estuary. If you have a boat, you can head further up the river. Just past the boat ramp at Marton, the river turns into the East Arm. Up here you are likely to see the Little Kingfisher, Great-billed Heron, and Mangrove Robin, as well as Shining Flycatcher, Large-billed and Fairy Gerygones. There are several tour guides which will take up to this part of the river – have a look at our section on boat charters to find a suitable one. 5. North of Cooktown is the Endeavour River valley. There is a suspension footbridge in Marton across a tributary of the river, which gives excellent access to the river habitat, as well as Jensen's and Leggett's Crossings off the main road. Here you will find gallery rainforest species such as Shining Flycatcher, Grey Whistler, Macleay's and Graceful Honeyeaters, Large-billed Gerygones, Tropical Scrubwrens and Chestnut-breasted Cuckoo. Australian Bustards are found in the open paddocks once you cross the Endeavour River bridge. Keep a look out along this road, as Red Goshawks are often sighted gliding over the rainforest and open fields. A great place to base yourself to explore the riverine rainforest is the Endeavour River Escape Camping Ground. There is also a number of lagoons on this excellent property. If you keep going north, you will find Hopevale coastal heathlands. When the banksias and grevilleas flower, the White-streaked Honeyeaters are numerous. Travel out to Elim Beach to find some more good wader spots. There is also a good camping ground here. 6. A longer trip, but worthwhile, takes you on the Battlecamp Road, past Isabella Falls. A few kilometres past the falls, is the McIvor Roadthat goes past rainforest creeks and eucalypt forest. There are several species to be seen along the road – including White-streaked Honeyeater, Tropical Scrubwren, Grey Whistler. Continue on through more open country and a few farms, and then stop at the McIvor River causeway. This is a corridor for flycatchers, honeyeaters, kingfishers and the Black-winged Monarch during November to March. If you have the time, continue onto Mt Webb National Park for more rainforest birds. If you do not turn off down the McIvor Road, then continue along the main road, crossing the Normanby River. You should stop here and have a look for the riverine species you may have missed, including White-streaked Honeyeater, White-gaped Honeyeater, Black-chinned Honeyeater. On the escarpments and woodlands you will also find the drier country species, such as Black-backed Butcherbird, Yellow Honeyeater, Diamond Dove, Squatter Pigeon. And always keep a look out for Button-quails – you might be lucky and manage to see the enigmatic Buff-breasted Button-quail. Further north of the Normanby River, is Lakefield National Park with its lagoons and waterbirds. At the Laura River crossing, search among the pandanus for the Crimson Finch (white-belly form), as well as other finches. The road from Laura to Lakeland crosses the Laura River several times. Stop and search for any of the riverine species you may still be missing. The escarpment country here is also home to those you may have missed in the drier country further east. As you return down to Lakelandkeep an eye out for the bustards, brolgas, and birds of prey such as Black-breasted Buzzard, Square-tailed Kite and Peregrine Falcon. Being the gateway to Cape York Peninsula, there are some Cape York special species that do in fact get as far south as Cooktown itself. White-streaked Honeyeater is found as far south as Shipton's Flat area, wherever there are flowering eucalypts, banksias and grevilleas, but not in the rainforests. They are also in the heaths along the Endeavour River at Marton, and in the Hopevale coastal area. Tropical Scrubwren can be found in the rainforest patches around Cooktown, such as Mt Cook National Park, and along the Endeavour River. Black-backed Butcherbird is found in the drier country in the escarpments of Battlecamp and Laura Ranges. Start looking for these north of the Normanby River crossing on the Battlecamp Road, or from Lakefield on the main Peninsula Development Road. Black-winged Monarch are a summer wet season visitor from New Guinea, and are regular breeders just north of Cooktown, at McIvor River crossing. But they have also been recorded south of Cooktown, in the Shipton's Flat area. Buff-breasted Button-quail was first discovered in the Cooktown area. We don't have any reliable spots for these elusive ground-dwellers, but keep an eye open for them, especially among the escarpment country. There is always the potential to turn up other Cape York specialities, so keep an eye out for these! Many visitors come during the dry season when the weather is cooler. But if you want to maximise your chances of seeing our Cape York specialities, and the northern wader migrants, then plan your trip for October-early December. This is when the New Guinea migrants have generally arrived back in this part of Queensland, and the wet has generally not yet limited access to some further locations. This is also when the waterbirds are at their most spectacular.